Books | Joseph Glenmullen, M.D. Publisher’s Description: Roughly 28 million Americans — one in every ten — have taken Prozac, Zoloft, or Paxil or a similar antidepressant, yet very few patients are aware of the dangers of these drugs, nor are they aware that better, safer alternatives exist. Now Harvard Medical School’s Dr. Joseph Glenmullen documents the ominous long-term side effects associated with these and other serotonin-boosting medications. These side effects include neurological disorders, such as disfiguring facial and whole-body tics that can indicate brain damage; sexual dysfunction in up to 60 percent of users; debilitating withdrawal symptoms, including visual hallucinations, electric shock-like sensations in the brain, dizziness, nausea, and anxiety; and a decrease of antidepressant effectiveness in about 35 percent of long-term users. In addition, Dr. Glenmullen’s research and riveting case studies shed shocking new light on the direct link between these drugs and suicide and violence. Written by a doctor with impeccable credentials, Prozac Backlash is filled with compelling, sometimes heartrending stories and is thoroughly documented with extensive scientific sources. It is both provocative and hopeful, a sound, reliable guide to the safe treatment of depression and other psychiatric problems. Click here to purchase this book from Amazon. Publisher’s Description: With the FDA’s warning that antidepressants may cause agitation, anxiety, hostility, and even violent or suicidal tendencies, these medications are at the forefront of national legal news. Harvard physician Joseph Glenmullen has led the charge to warn the public that antidepressants are overprescribed, underregulated, and, especially, misunderstood in their side and withdrawal effects. Now he offers a solution!More than twenty million Americans — including over one million teens and children — take one of today’s popular antidepressants, such as Paxil, Zoloft, or Effexor. Dr. Glenmullen recognizes the many benefits of antidepressants and prescribes them to his patients, but he is also committed to warning the public of the dangers associated with overprescription. 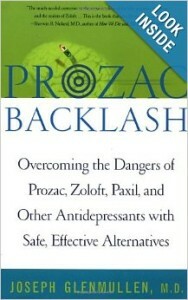 Dr. Glenmullen’s last book, Prozac Backlash, sounded the alarm about possible dangers. The Antidepressant Solution provides the remedy. It is the first book to call attention to the drugs’ catch-22: Although many people are ready to go off these drugs, they continue to take them because either the patient or the doctor mistakes antidepressant withdrawal for depressive relapse. 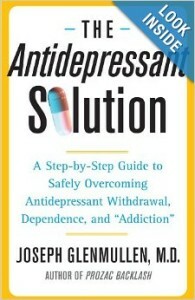 The Antidepressant Solution offers an easy, step-by-step guide for patients and their doctors.Written by the premier authority in the field, The Antidepressant Solution is an invaluable book for all those concerned with going through the process — from friends and family members to doctors and patients themselves. Click here to purchase this book from Amazon. Publisher’s Description: Joseph Glenmullen, M.D. is a clinical instructor in psychiatry at Harvard Medical School is on the staff of Harvard University Health Services and is in private practice in Harvard Square. He is the author of Prozac Backlash: Overcoming the Dangers of Prozac, Zoloft, Paxil, and Other Antidepressants with Safe, Effective Alternatives and Sexual Mysteries: Tales of Psychotherapy. A graduate of Brown University and Harvard Medical School, Dr. Glenmullen lives with his wife and three children in Cambridge, Massachusetts. Click here to purchase this book from Amazon.